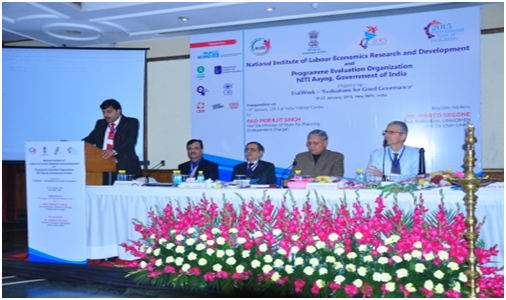 A roundtable consultation was organized on September 26, 2014 by the National Institute of Labour Economics Research and Development (NILERD), Delhi, India in collaboration with the erstwhile Planning Commission, Government of India. The international Community of Evaluators identified various pressing issues related to evaluation. The Roundtable was organized to deliberate on these issues. Discussions/brainstorming sessions were held to address important areas, both at Global as well as National level. The programme was inaugurated by Mr. Pawan Agrawal, IAS, Adviser (HE), erstwhile Planning Commission, Government of India and the then Director-General, NILERD (Additional Charge). The event was represented by 17 participants from various national and international organizations such as UNICEF, UN Women, ISST, CMS, erstwhile Planning Commission, 3i.e. among others. To deliberate on the challenge as to how the global evaluation community can contribute to ensuring that evaluations play a key role in planning and implementation of policies and programmes for attaining future sustainable development goals at national, regional and international levels. Issue 1: What are the most important strategies to ensure that governments and parliaments improve policy making and implementation by demanding and using equity-focused and gender-responsive evaluation in decision making? Issue 2: What are the most important strategies to ensure that civil society organizations in general and voluntary organizations for professional evaluation in particular have stronger institutional capacities to contribute to equity-focused and gender-responsive national evaluation systems? Issue 3: What are the three most important strategies to ensure that individual evaluators have the capability to produce good quality, context-relevant, equity-focused and gender-responsive evaluations? Issue 4: How to ensure that enabling environment, institutional capacities and individual capabilities will mutually reinforce each other? And, how to ensure that diverse multi-stakeholders work in partnership based on their own value added and comparative advantages? 1. There should be a push for a national plan/policy for evaluation. 2. There should be a resource mapping with regard to capacity development in evaluation. 3. Evaluations are to be mainstreamed in the national planning with focus on social inclusion and gender equality. 4. A repository on how the behaviour change takes place and what has worked, should be developed in the form of successful case studies. 5. Events should be organized on evaluations by involving university community. 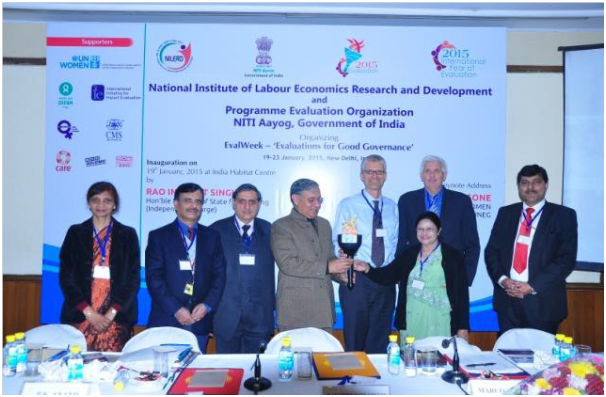 An Evaluation Week on ‘Evaluations for Good Governance’ was organized by NILERD and Programme Evaluation Organization (PEO), NITI Aayog (formerly Planning Commission), Government of India, from 19th–23rd January, 2015 to celebrate the International Year of Evaluation 2015. The EvalWeek marked India as the first country to kick-start the celebrations of the International Year of Evaluation and the first country to receive the EvalTorch which was handed over by Marco Segone, Director IEO, UN Women and Vice-Chair UNEG, to Rao Inderjit Singh, Hon’ble Minister of State for Planning (Independent Charge), Government of India. 3. To advocate and share lessons on utilization of Evaluation findings through approaches promoting increased sense of participation and ownership. 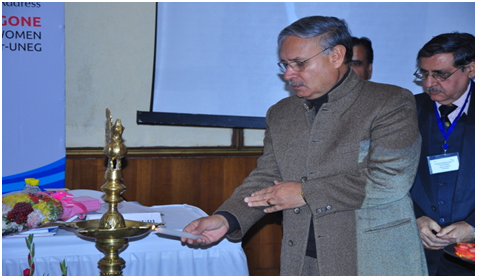 Rao Inderjit Singh, Hon’ble Minister of Planning (Independent Charge) inaugurated the five-day event on 19th January, 2015. A Compendium of research papers on evaluation titled, ‘Evaluations for Sustainable Development: Experiences and Learning’ was released by the Hon’ble Minister. A number of national and international experts participated in the deliberations. Various partners including UN Women, CMS, International Initiative for Impact Evaluation (3ie), Oxfam, Care, Restless Development, Institute of Social Studies Trust (ISST) and Development Evaluation Society of India (DESI) joined hands together and organized various events. The valedictory session was chaired by Smt. Sindhushree Khullar, CEO, NITI Aayog. Topics covered during various technical sessions of the five-day event included evaluation culture through sensitization; policy support to evaluation for better governance and enhanced outcomes; strengthening evaluation capacities; sessions on social sector; use of econometric techniques in evaluations; promoting social accountability; innovative approaches to evaluation; and role of academia in achieving evaluation goals. 1. Equity and gender-focused, bottom-up development are sustainable development priorities in India that need to be integrated. 2. There is a need for Evaluation Policy to systematize evaluations and enhance their utilization. 3 . There are very few mainstream tools or indicators to accurately measure empowerment outcomes. 4. The gap between policy planners, implementers and community needs to be bridged. 5. Capacity development is required at national, state and district levels. 6. Online monitoring indicators to be developed for important schemes and programmes and impact evaluations need to be conducted. 7. There is limited evidence on what works, how works and for whom? 1. New developmental interventions have been made like Jan Dhan Yojana, Make in India etc. by the Government of India. There is a need to develop measurable and monitorable indicators with community participation with a bottom-up approach to facilitate their optimal impact. 2. Mapping of good practices, experiences and learning about conditions that make a programme successful to be brought out from time to time as knowledge products; put in place a mechanism for sharing success stories with state governments. 3. An evaluation policy with gender focus to be prepared at national level which could also be adapted by states. 4. Capacity development programmes in evaluation to be introduced either as a separate discipline or short-term/diploma courses in various streams of evaluation. 5. Evaluative thinking to be developed for enhancing demand and increasing use of evaluations through sensitization at various levels. 6. There is a need to bring together various stakeholders involved in sustainable development agenda by having a Community of Evaluators from India that would give professional stature to development and evaluations in facilitating the above action plans.